A planetary crisis “threatening the young and unborn” compels a “substantial, gradually-increasing carbon tax with all revenue distributed directly as monthly ‘dividends’ to each household,” Dr. James Hansen told Congress today. Hansen, director of NASA’s Goddard Institute for Space Studies and the unofficial dean of climate scientists, testified that measurements of Earth’s historical climate sensitivity to atmospheric CO2 make clear that rising levels are now driving our climate into ranges that will have lethal consequences. Current concentrations of 385 ppm amplify dangerous feedback mechanisms such as loss of reflective ice surfaces and release of methane gas from permafrost, he said. Atmospheric concentrations must be brought below 350 ppm as quickly as possible, Hansen stressed, specifically rejecting the target of 80% reductions by 2050 advocated by leading environmental groups. Hansen testified at a House Ways & Means Committee hearing this morning, kicking off debate in Congress over legislation to help the U.S. achieve deep cuts in carbon emissions through a cap-and-trade system, a carbon tax, or perhaps a hybrid approach. Hansen and Union of Concerned Scientists geochemist Dr. Brenda Ekwurzel both testified in favor of vigorous action, although they differed on the cap vs. tax question. A third witness, University of Alabama professor John Christy, argued for a go-slow approach. Hansen told the committee that a transparent carbon tax with direct dividend would “spur rapid replacement of our inefficient infrastructure” and lead to an “efficient phase-out of coal.” He strongly criticized cap-and-trade proposals, calling caps “hidden taxes,” contending that they would undermine essential price signals through price volatility while enriching traders and lobbyists at the expense of the public. He predicted that cap-and-trade could lead to "blackmail" by electricity suppliers, who would force the public to choose between meeting emissions targets and blackouts, and pointed out that the European Union’s cap-and-trade system has failed to reduce carbon emissions. UCS’s Ekwurzel testified that acidification has already diminished the oceans’ ability to absorb more carbon dioxide — a development that will accelerate global warming. She advocated a “cap and invest” program in which emission permits are auctioned and the proceeds used to finance energy efficiency and renewable energy. Christy’s appearance was sponsored by Republican members of Ways & Means. He testified that cloud effects outweigh human effects on climate, and contended further that any U.S. actions to reduce emissions would be overwhelmed by emissions from China and India, both of which have rejected carbon caps. He suggested that the best way to reduce CO2 emissions is a massive nuclear power construction program. Committee Chairman Charles Rangel, who represents Manhattan’s Harlem neighborhood and parts of the Bronx, asked Hansen about the effects of a carbon tax on low-income households. Hansen explained that under his proposal to distribute 100% of carbon tax revenues to U.S. residents, a steadily increasing tax reaching $115 per ton of CO2 would result in estimated dividends of $9,000 per two-child household, assuming that adults got one “share” and each of the first two children got one-half. [Ed. note — Using CTC’s carbon tax impact model, we estimate that a $115/ton carbon tax would provide the average family of four with a $7,500 annual dividend.] Hansen noted that because households that use below-average amounts of fossil fuel would receive more in dividends than they paid in higher energy costs, his program would help the vast majority of middle- and lower-income Americans. Hansen also cited Congressional Budget Office findings that carbon taxes are five times as efficient as caps at reducing emissions. UCS’s Ekwurzel argued that retrofitting homes and transportation would be a better use of carbon cap revenue than direct dividends. However, she did not address whether “breaching” strict revenue-neutrality on behalf of energy efficiency and renewables might unleash a torrent of less benign uses of the cap or tax proceeds. For his part, Christy seconded Hansen’s view that a carbon tax would be more transparent than a carbon cap-and-trade system. Rep. Dave Camp (R-Mich.) and several other Republican members branded carbon caps as hidden taxes. They insisted that the Ways & Means Committee assert jurisdiction over any cap or carbon tax legislation. Rep. Sander Levin (D-Mich.) responded to Christy’s testimony, saying “nobody is talking about the U.S. acting alone.” Hansen explained that the U.S. could use “average carbon content data” to set tariffs on goods from countries that didn’t enact their own carbon taxes. A U.S. tax with harmonizing tariffs would encourage trading partners to enact their own carbon taxes to negate tariffs and capture tax revenue themselves, he said. During a recess in the hearing, Peter Barnes of Cap and Dividend and Mike Tidwell of Chesapeake Climate Action Network asked Hansen if he would support legislation to cap emissions and recycle revenue via a direct “dividend” to households. Hansen replied, "I don’t see what a cap gets you. We need maximum reductions as soon as possible and a tax gets that." Committee members asked one cogent question after another. Rep. Jim McDermott (D-Wash.) focused on volatile prices under a cap, which he said would discourage clean energy entrepreneurs. Rep. Chris Van Hollen (D-Md. ), a strong supporter of cap-and-dividend, asked about revenue-recycling, noting Hansen’s testimony that a carbon price will need to be high enough to affect behavior and purchasing decisions. Rep. Doggett noted that Exxon now supports a carbon tax after years of climate-change denial. Hansen stressed the importance of a dividend to ensure continued political support as carbon prices rise. He urged Congress to direct the National Academy of Sciences to report on climate science as a way to end the debate over anthropogenic global warming once and for all. Photo: Flickr / World Development Movement. Here in Appalachia we just wish they would stop tearing our mountains down. 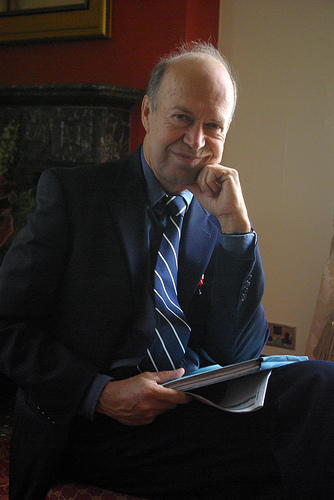 Question for James Hansen and CTC:Would it not be advantageous to use dividends to give consumers an equity stake and interest in decarbonization?This could be achieved by investing carbon tax revenue in renewable energy and clean technologies in exchange for equity, and distributing equity shares to the public on an equitable per-capita basis. The shares would yield dividends that increase — not decrease — as carbon is phased out. Intriguing idea: invest the dividend in renewable energy / clean tech and build our country’s savings and clean energy infrastructure. It’s a push/pull, too: A rising carbon price would make those investments increasingly profitable. Or the option to cash in, with tutorials on how investing brings money in when you are careful. The consumer culture has taught folks to how to secure credit card interest charges, not dividends from investments. Coal is now the cheapest "source of fuel" for our utilities. Coal mines employ 1000’s of workers. How will this affect the coal producing states of the USA?Who will employ the "coal miners"? If someone can come up with a cheaper source of fuel,(than coal), for our utilities, have them, produce it now. Why delay? Nuclear would be the cheapest and best way for utilities to produce electricity. We need more safe nucleur plants to generate our energy needs.